More than 1 million mild traumatic brain injuries occur nationwide each year. These injuries can be caused by falls, car crashes or recreational activities like bike riding, skateboarding, skiing or even playing at the playground. More than half of concussions occur in children—often when playing organized sports such as football and soccer. Although concussions are considered to be a mild brain injury, they need to be taken seriously. They should not be treated as minor injuries that quickly resolve. With proper care, most people recover fully from a concussion. In some cases, a concussion can have a lasting effect on thinking, attention, learning and memory. 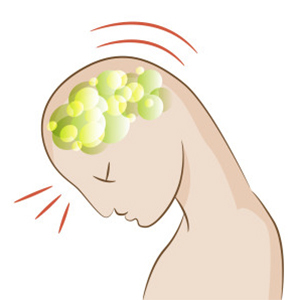 A concussion can arise from the brain moving either rapidly back and forth or banging against the side of the skull. This sudden movement can stretch and damage brain tissue and trigger a chain of harmful changes within the brain that interfere with normal brain activities. A concussion isn’t visible from the outside, and you can’t see it with standard imaging tools like MRI and CAT scans. Instead healthcare providers look for signs and symptoms of abnormal brain function to make a diagnosis. Loss of consciousness occurs in about 1 in 10 concussions. A person with a concussion might have trouble answering basic questions or move in an awkward, clumsy way. Symptoms can start quickly, or they can be delayed and appear over the next day or two. For about 9 in 10 people with concussions, symptoms disappear within 7 to 10 days. Scientists have been working to learn more about those who take longer to recover. In a NIH study the majority of these kids recovered quite quickly or showed no increase in symptoms at all. On the other hand, a subgroup of kids, about 10% or 20%, showed a dramatic onset of symptoms after their injury and persistent symptoms that in some cases remained even 12 months after the injury. If someone has symptoms of concussion, they shouldn’t try to finish the quarter or finish the game. They need to be taken out of play right away and be seen by a health care provider. Our physical therapists have special vestibular and concussion rehabilitation training to help patients with a safe and optimal recovery time (optimal does not necessarily mean fast). No two concussion injuries are the same. Different areas of the brain may be involved so your physical therapist will perform a thorough evaluation of your neurological system, musculoskeletal system, and balance systems. Rest and recovery – patients with concussions often need to rest their brain and body during the recovery process. This includes a personalized and closely monitored program to limit physical, thinking, and remembering activities to avoid symptoms getting worse. Proper sleep hygiene (sleep habits) are also very important and our specialists can help with education to help concussion patients get a better night’s rest. Restoring strength and endurance – rest can quickly lead to deconditioning of your body or in other words, the rest and recovery after a concussion means you will “get out of shape”. Our trained clinicians will prescribe a graded neuromuscular and endurance training program to help you get back to daily activities and/or sporting events. Return to Sport and Your Normal Daily Activities – it’s important to add the appropriate level of exercises and functional activities gradually because too much stimulation may cause the symptoms to TEMPORARILY worsen. With a proper assessment and closely monitored treatment program most patients will fully recover with minimal residual deficits. It is very important to follow the instructions of our physical therapist that are highly trained in the rehabilitation of concussion injuries.